When analyzing the poem named «If You Forget Me» it’s essential to know the historical context and the author’s personality. The thing is that Pablo Neruda’s life – life of a politician, an exile, a politician again and also a poet whose life and death were really contradictory – gives us an opportunity to look at his poetry in a completely different way. It also concerns the addressee of «If You Forget Me» written during the exile in Switzerland. Was it his wife Delia or his mistress Matilda, or were those words addressed to his country that he had had to leave? Also you should know that Pablo Neruda is a Nobel Prize Laureate in Literature of 1971. «If You Forget Me» was first published in a book called “Captain’s poetry”. By the way, the author wasn’t named in the first edition. That was so because of Pablo Neruda’s special situation: he had to leave his homeland, Chili, because there was a threat to his life. But in this time he is not only a political exile called a betrayer in his homeland, but also a conscious betrayer of his wife that followed him in immigration. Young and attractive Matilda becomes his muse while his loyal wife Delia is experiencing a betrayal, emotional and then physical. Pablo Neruda himself explains absence of his name in the first edition of the book by the fact that passionate poems addressed to his mistress would hurt his wife, and at that moment he didn’t want this to happen. In his diaries he calls his wife Delia «sweetest of consorts, thread of steel and honey tied to me during the years when my poetry said most, was my perfect mate for eighteen years». The poem starts with very simple messages and sets a tone this way. «If You Forget Me» begins, «I want you to know one thing». The heading and the beginning of the poem make that special tone that is essential for reaching the main purpose. Indeed, there is a story about love, but not a simple one. Love that is not unconditional. Love that the author is ready to give only in exchange. It’s interesting that the clarity of messages in this poem is easily perceived by a reader. There is no multiplicity of characters or a complex plot in it. All the six stanzas are one short message – message of a passionate love. However, technically the author gives the poem a certain individual image using enjambment. This technique was introduced into versification by the French, and it requires logical and semantic incompleteness of each line. The continuation is needed, and the reader stays in suspense reading the next lines. 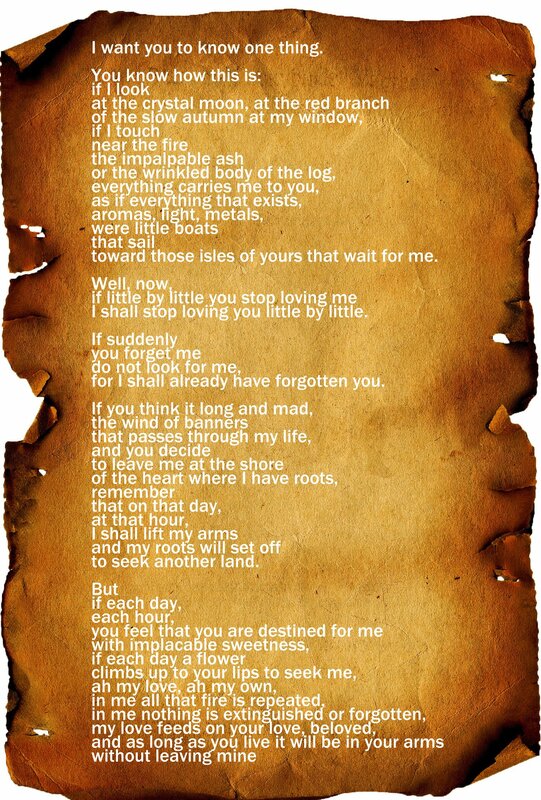 Deep imagery wasn’t characteristic for Pablo Neruda, however we can see a lot of images in this poem. But the majority of them is just for description. Being filled with love, the author sees floating boats and red autumn leaves in a completely different way. His look is escalated by obsession of an enamour, and the reader can feel these differences. Also there are unexpected analogies, because bright autumn leaves are flame that stands out acutely against the sky and at the same time is lover’s lips. The red colour of the leaves and lips is about both love passion and the fact that the leaves will soon turn to dust. The author doesn’t know yet which this red colour will be in his destiny. He is not sure if his love will be short-term, fast-dying, or will turn to a fire that will change his whole life. «If You Forget Me» was unlikely written according to a preliminary plan. It is likely that it was spontaneous. In the depth of it there lies a thought discovered unexpectedly by the author: If little by little you stop loving me I shall stop loving you. And indeed, flame devours everything and only leaves ash. This ash can’t flare up again, the fire isn’t its master. What will win – ash and parting or fire and love? It seems like the author leaves the choice for his lover, but in fact he offers her more than just his body. He offers her his life, his beliefs and limitations connected with protection of these beliefs. He is expecting a clear answer – either they keep burning in the fire of his beliefs together or he forgets her before she does. And if this poem is not only dedicated to a woman, but also to his country, this is also an ultimatum for Chili.